Our assistants all have a very high standard of professionalism and know exactly what it takes to be an outstanding employee (remember, they’ve been through the rigorous AVirtual recruitment process and succeeded), which combined with great communication skills, qualifies them to write a killer job vacancy advertisement on your behalf. 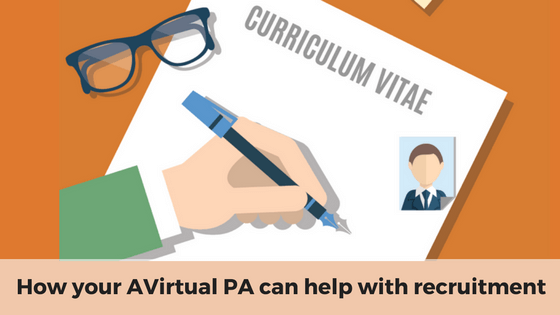 Of course, you’re the one who really knows what you’re looking for so be sure to supply your PA with a list of essential skills and experience, which they can type up into an advertisement for you to check, before they publish it onto relevant sites. We encourage all of our assistants at AVirtual to use LinkedIn regularly to grow their professional network. We train them on how to efficiently use the site and create an effective profile, so they all know what a good profile looks like and what makes a person stand out. You can ask your assistant to research and present you with a list of potential people to contact, rated according to their suitability to the job description.